So, this is a classic case of not being able to leave well enough alone. After I fixed the guitar up it did play really well and sounded fine with nylon strings. But within my collection it was redundant. I already have an acoustic guitar with nylon strings and considering the work I already did to it makes it generally unsaleable I figured I couldn't make it any worse. Here are a few audio tests I made with the guitar. My playing is not that great but it should give you an idea of what it sounds like. Again, I am not that good with a glass slide so that is not as clean as I would like it. But I banged around on the guitar to give the general spectrum of audio quality. 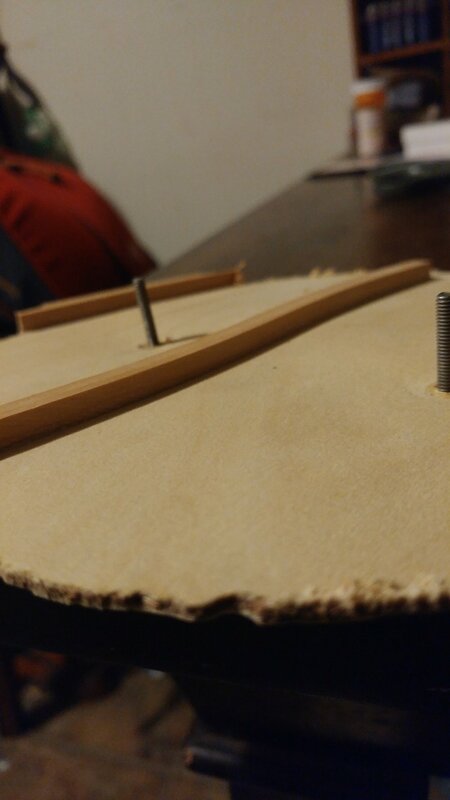 Also, while I did do a lot of work to the bridge to make it playable again, the belly of the guitar was still warped from the years of pull, so why not just cut it out. This is the bottom of the piece I took out and you can see that it even warped the bracing. For the resonator bell I used and old strainer and cooking pot lid. But they both had a really good ring to them and were the right size. I have been wanting to teach myself a bit of slide guitar but have never gotten around to it so I set it up to this one up to be a slide guitar. This means that the action is a lot higher then I usually set my guitars up to be but it is still not very high for a proper slide guitar.... I figured I would meet in the middle. I am also not very good with a glass slide but I do make them so now is my chance to learn.